My mom loves mystery stories, but I’ve never really seen the appeal. While we both love reading, she likes to puzzle out the mystery as she reads along. I can’t help myself from flipping to the back of the book. Now that I’ve played Sherlock Holmes: Consulting Detective, however, I finally understand the thrill of sleuthing. I grabbed this game to play with my boyfriend, who is a huge Sherlock Holmes fan. Like mystery stories in general, Sherlock Holmes doesn’t do a lot for me. He’s smug, arrogant, and because he exists in a fictional universe he’s got the audacity of always having the answers. The difference in Sherlock Holmes: Consulting Detective is that the titular investigator is basically absent. You’re handed the beginning of a Sherlock Holmes story, and then asked to find the ending. What I love most about this game is everything that comes in the box. You’re given a case file with a sealed envelope on the back page, which contains a small slip of paper that holds the answer to the mystery. Each case has newspapers to peruse to help you investigate. You also have a directory of London and a corresponding map, which are your complete guide to following leads from the story. Want to talk to a seller of rare books? Need to look at the cab dispatch? Talk with Mycroft Holmes? It’s on the map, and as long as it has a corresponding entry in the case file you can see how it connects to the larger story. Players take turns being lead investigator, deciding where to go next. That doesn’t mean other players aren’t allowed to talk out their theories as they go along. There’s a win state and a scoring system: you’re attempting to beat Sherlock at solving the case by following fewer leads than him, and you’re scored against how many more or fewer locations you visited. But once you get wrapped up in a case and have clues completely blow your working theory, it gets easy to forget all about how many points you’re earning. In our game, my boyfriend and I went to about 20 locations while Sherlock visited about six. Needless to say our score was absolute garbage, but we couldn’t help ourselves. My boyfriend told me he wanted to go back and read the entire case file after we finished because he found it so interesting. 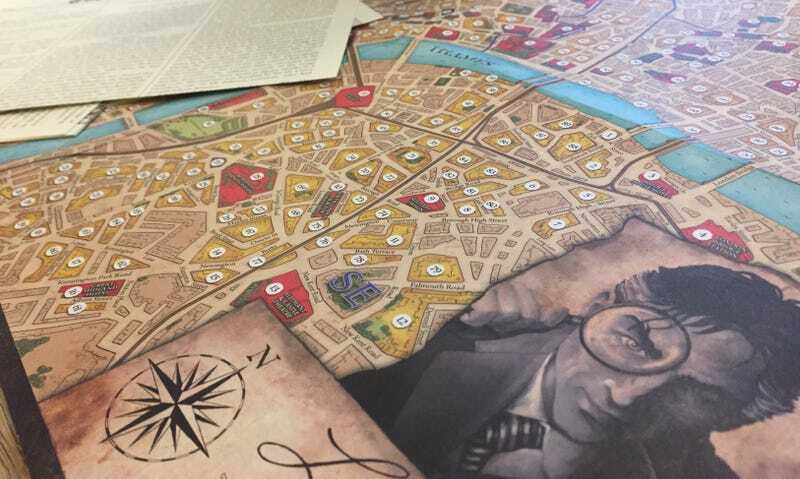 What makes playing Sherlock Holmes: Consulting Detective so much more thrilling than reading a mystery story is not just that the ending is out of reach—it’s having someone to react to when things start to get crazy. At one point, when we were at the end of our rope, I perfunctorily flipped to a location we hadn’t yet visited. As I read the clue aloud, my voice got higher, my speech got faster, and I grabbed my boyfriend’s hand and shrieked, “He has a twin? !” He flipped through the notebook he had been using to write down seemingly important facts, trying to piece together how this changed the case. We started talking excitedly over each other about how we now totally knew who the murderer was. It’s rare that I feel truly surprised and excited by games in the way that Sherlock Holmes: Consulting Detective made me feel. Sherlock Holmes: Consulting Detective feels exhilaratingly open for a game that has a premise steeped in a very specific canon and genre. But the flavor trappings are just a frame to hang around a fun session of collaborative storytelling and puzzle solving. I might not pick up my mother’s mystery novel obsession, but I cannot wait to play this game again.